I’ve had Naomi Novik’s work on my reading list for a long time, but this was my first time picking up anything by her. I loved the Rumpelstiltskin story as a child, so when I heard that she was writing a retelling of it, I knew I had to get my hands on a copy—and now, it made me wonder how I ever lived without the incredible worlds of magic and fantasy she crafts. I wasn’t sorry they didn’t like me, I wasn’t sorry I had been hard to them. I was glad, fiercely glad. The story alternates perspectives, primarily between the women in the story, with its focus resting mainly on Miryem (the tax collector’s daughter), Wanda (Miryem’s hired help), and Irina (the local duke’s daughter). Gradually, we also see perspectives from the tsar, Wanda’s youngest sibling, and Irina’s nursemaid, and while the shifts in narrators offer potential for chaos and disjointed storytelling, Naomi Novik shows off every bit of the necessary skill to make it work. They would have devoured my family and picked their teeth with the bones, and never been sorry at all. Better to be turned to ice by the Staryk, who didn’t pretend to be a neighbor. Miryem is by far my favorite character in this story: she is cold, clever, and ruthless when she needs to be, but never without justification, and never unfairly. Her perspective is not only the one I enjoyed the most for entertainment’s sake (especially when she interacts with the winter feyfolk, the Staryk), but also for the empowerment her narrative offers. Miryem’s family is Jewish, and there’s a lot of commentary made throughout the story to remind the reader of the pains Jews have been through and the judgments they have faced, and continue to face, in their daily lives. More than anything, though, I think Spinning Silver is a story of feminism and independent, strong-willed women. Each of our three most important narrators suffer under a man who has, intentionally or otherwise, controlled and/or ruined their life: for Miryem, it’s the lazy father who forced them into starvation; for Wanda, it’s the abusive, drunkard father who wants to sell her off for spirits; and for Irina, it’s the controlling, uncaring father and the terrifying man he wants to marry her off to. Despite their respective circumstances, these young women all learn how to work together and to fight their way out of one mess after another. But it was the same choice, every time. The choice between the one death and all the little ones. Beyond the representation and strength, Spinning Silver is just a damn good fantasy tale. 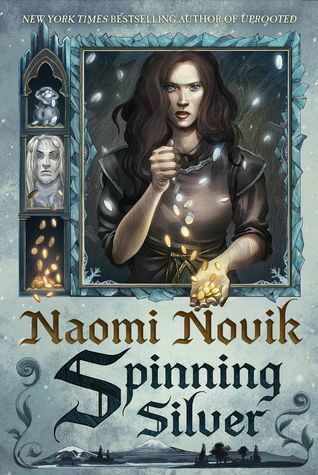 It mimics the Rumpelstiltskin story just enough to draw in old fans, but Novik’s writing takes liberties endlessly to make it her very own story. The writing voice in and of itself is magnificent; I found myself highlighting so many passages just because the phrasing she uses and the scenery she paints gave me chills. This is also one of the most atmospheric wintry stories I’ve ever read in my life. If I haven’t convinced you yet, I’ll also tell you that there’s a delightful enemies-to-lovers twist (you’ll have to read it to find out which girl it involves, though, because I’m not telling! ), sweet families and sibling bonding moments for days, and so much tension that I’m positive you won’t want to put it down until you’ve found out how it all ends. Because that’s what the story’s really about: getting out of paying your debts. Trigger warnings for anti-Semitism, sexism, parental abuse, family death, and alcoholism. Thank you so much to Del Rey for providing me with this beautiful finished copy in exchange for an honest review! I haven’t anything by her but I love this cover! It’s on my TBR 🙂 great review as always! It is absolutely stunning! ❤ And thank you! Awesome review! You had me at enemies to lovers, I’m a sucker for that trope. Thank you! 😀 Haha, I am too, it’s one of my all time faves! It’s subtle and doesn’t really kick in until about the second half of the book, but I enjoyed it a lot. You’re welcome! And that’s great to hear, I’m even more excited about this one now! I hope so. :-) I read a few of her dragon books years ago – I’m looking forward to revisiting her writing! Literally dying to get my hands on this one. I was blown away by her book Uprooted so I’m excited to get back into her writing. Great review. I wasn’t sure if I wanted to read this because I’m not always a huge fan of fairytale retellings but it sounds amazing and I think I’ll have to check it out after all. Thanks for the great review! Thank you so much! Retellings are hit-and-miss for me, because if they too closely resemble the source material, I feel like I get bored easily. Thankfully, this one definitely reads like its very own story, in my opinion! There are a lot of characters, but thankfully they’re pretty easy to keep track of! They all have very distinctive voices and personalities – otherwise, I would have been totally lost! I am literally stalking my B&N order to see when it ships because I need it NOW. Great review and I am so glad you loved this one! After reading this, I really can’t wait to finally pick up Uprooted soon! I’ve heard so many amazing things about Spinning Silver already and I can’t wait to read it. Thank you so much! 🙂 I hope you get to check it out soon! That was honestly my favorite aspect – you could feel the inspiration of the original material but it was 100% Naomi in the execution.